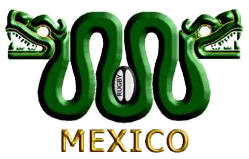 The Mexican national rugby union team represents Mexico in international rugby union competitions. Mexico entered the IRB International Rankings in March 2012, ranked initially in joint 71st place with other new entrants Pakistan and the Philippines. A record crowd for a Rugby match in Mexico saw the home team dispatch Jamaica 68-14 in Mexico City to open their NACRA Caribbean Championship account with a victory in a match that also doubled as the opening Rugby World Cup 2015 qualification match at the Universidad Iberoamericana football grounds. The home side kept their hopes alive of progressing to face the winners of the CONSUR B tournament in the South American region in the next phase of qualifying with an excellent display of pace, power and execution, running in nine tries in front of more than 2,000 vociferous fans. Mexico's first official test match, and first participation in Rugby World Cup qualifying, was in March 2008. In that match, Mexico secured a 47-7 victory over Saint Vincent and the Grenadines national rugby union team in 2011 Rugby World Cup qualifying. Mexico's record in qualifying was 2-2, finishing 6th place in Round 1A of the Americas qualification zone. Updated to 30 June 2014. Mexico squad for the 2015 Rugby World Cup qualification match against Cayman Islands. ^ "Third Concentration of Serpents".